Looking for some high-yield investments that will keep paying you for years to come? Take a look at Total SA, Terra Nitrogen Company, and Holly Energy Partners. With this in mind, three that fit the bill of stocks with more than 5% today and have a reasonable chance of maintaining that dividend payment are Total (NYSE:TOT), Terra Nitrogen Company (NYSE:TNH), and Holly Energy Partners (NYSE:HEP). Let's take a quick look at each to see how they will be able to keep those dividend checks coming in. One of the benefits of owning Total is that, as an integrated oil and gas company, it has assets across the entire value chain to help offset volatility from commodity prices. Having this advantage doesn't mean a company can simply rest on its laurels and wait for the profits to come in, though. To its credit, Total has done a commendable job of improving its profitability even while oil and gas prices are in the dumps. Though most of its peers have seen profits from upstream production decline by more than 75%, Total has managed to bring on a large amount of new production from low-cost sources, which has resulted in only a 58% decline in upstream production earnings. While it's challenging for oil and gas companies to make considerable profits at today's prices, Total is doing what it can to make sure it does. The company's 2016 capital budget is expected to be about $17 billion, a 32% reduction from 2015. At the same time, it is looking to cut its operational expenditures by another $2.4 billion. If it can remain on track for these targets, it should be in a decent place in terms of generating enough cash to pay for its capital budget and its dividends, even at today's prices. With a current dividend yield of 5.6%, Total looks to be in pretty decent shape to handle the downturn in oil and maintain its payout to shareholders. If oil stays in the $40-a-barrel range for a couple of years, then all bets are off. It will take a lot of things to go wrong for the industry, however, for that to happen. The first thing you should understand about Terra Nitrogen's dividend is that it isn't a fixed-rate dividend that is set by management. Rather, it is a variable-rate dividend that pays out all of the cash available at the end of the quarter after changes in working capital and capital investments. Also, it keeps its payout variable because Terra Nitrogen only has one facility, a nitrogen fertilizer and chemical product plant in Oklahoma. If that facility experiences any downtime, then it's not the best idea to try to pay out shareholders when no cash is coming in the door. At the same time, though, Terra Nitrogen has some distinct advantages going for it. The largest of these advantages is that the facility creates its nitrogen products from natural gas. If we have learned anything over the past several years, it's that the shale gas revolution in the U.S. is producing plenty of cheap natural gas. So Terra Nitrogen has a cheap feedstock that gives it a huge cost advantage over global suppliers. Another thing to like about Terra Nitrogen is that it carries zero debt on the balance sheet, a bit of a rarity for a master limited partnership. This cost advantage and spectacular balance sheet have led to incredible rates of return over the past few years, and even though the company's payout is "variable," it has stayed well above 5% ever since shale gas started taking off in 2011. 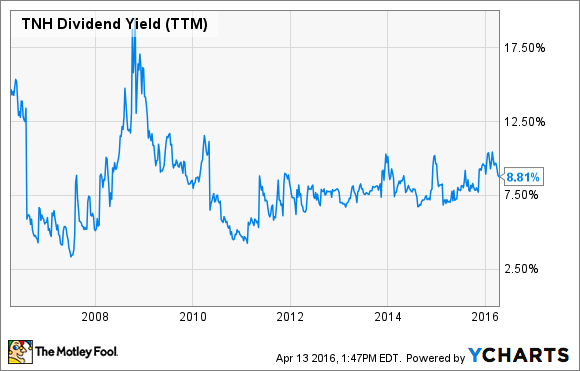 TNH Dividend Yield (TTM) data by YCharts. There may be a little up and down with the company's performance depending on any downtime for maintenance and the price of nitrogen fertilizers, but Terra Nitrogen certainly has the balance sheet in place to weather any major storms and should continue to crank out quarters with payouts above 5%. The oil and gas industry is completely awash in companies that yield more than 5%, but the longer this downturn drags on, the less viable some of these payouts look. Holly Energy Partners seems to have the legs to remain a solid investment yielding 6.6% today because management has grown the business. With the shale boom taking off across the U.S., it was extremely tempting for pipeline companies to binge on debt and grow their networks. Unfortunately, this kind of approach can only last when the industry is booming and capital is cheap and accessible. Rather than chase the industry's growth, Holly Energy Partners parent company, HollyFrontier (NYSE:HFC) focused on growing in ways that enhanced the value of its refining operations while not being wholly reliant on the capital markets for financing. This approach has proven to be more successful over time, as it has been able to increase its quarterly payout to shareholders for 45 consecutive quarters. Holly Energy Partners is in decent shape to manage the downturn in oil and gas rather well, but its peers have dragged the company's stock price down with them, giving shares of Holly Energy Partners' stock an attractive yield. As long as it continues on this path of measured growth, it should be able to maintain its streak of payout increases for some time.